Engineered to be an indispensable addition to your hunting kit, the Vortex Optics 10x42 Fury HD Laser Rangefinder Binocular is a multi-purpose optic that competently combines a powerful observation tool with a laser ranging device that can be operated one-handed. Optically, the Fury boasts a high magnification to allow for detailed observation of distant targets and coatings on the lenses and prisms to produce bright and clear high-contrast images with accurate color rendition - even in low-light. To help offset the appearance of visible hand-shake common with high-power binoculars, the Fury has a wide field of view and can be mounted on a tripod when used with an optional adapter. The rangefinder is activated using an intuitive two-button interface located on the right optical barrel. Its in-view display has three brightness settings and can be focused for clarity. Using an eye-safe IR laser, the Fury can accurately range reflective targets from 10 to 1600 yards and display the distance in either yards or meters. A built-in inclinometer measures the relative upward or downward angle to the target and a ballistic algorithm adjusts the displayed range to compensate for the angle to improve shot accuracy. Built to survive in punishing conditions, the Fury's chassis is wrapped in a protective rubber armoring that is textured to provide a secure slip-resistant grip. The optical tubes are nitrogen-filled and O-ring sealed to provide water and fogproof performance in even the most extreme conditions. All exposed lens surfaces are treated with Vortex's ArmorTek coatings to protect against scratches, oil and dirt. Tethered objective lens covers, and a one-piece ocular rainguard that connects to the neck strap, are easy to remove when quick reactions are required, and go on quickly to keep rain and snow out. 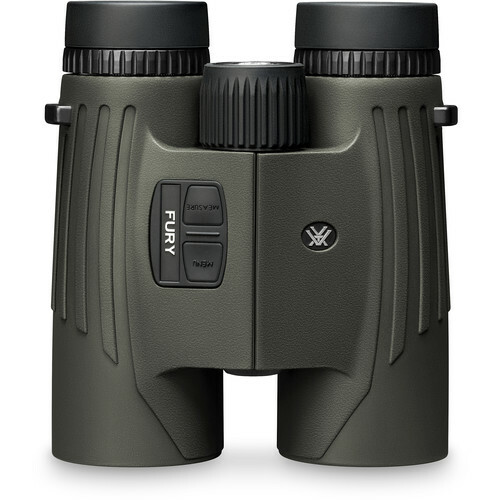 Interpupillary Adjustment 54 to 69 mm / 2.1 to 2.7"
Box Dimensions (LxWxH) 8.45 x 7.5 x 4.05"
10x42 Fury HD Laser Rangefinder Binocular is rated 4.8 out of 5 by 28. Rated 5 out of 5 by Mikenslugger from Great 2 in 1 setup, PEFECT!! This is the best of both worlds, you can have your binoculars and rangefinder in your hand at the same time. No more fumbling around grabbing your rangefinder after look at your target with your binoculars. Super fast target results an very simple to operate with one hand. Is the glass in these the same as viper HD model? What's the protection grade for this binocular? Sorry, dont understand the term Protection Grade ? Define the termand ask again. Ill do my best to answer your question. Do you meanprotection for the unit ie: water proof,shock proof -or- for the customer ie:money back, free replacement ect ?